When you use AWS CloudFormation templates to deliver your solutions, your users can get up and running with just a few clicks or commands. Users can launch an AWS CloudFormation stack with one of your templates, and AWS CloudFormation automatically provisions the specified resources and bootstraps the software running on them. Although users have several ways to create stacks from your templates, you can provide a quick and direct option for your users by constructing a launch stack URL. A launch stack URL takes users directly to the Create Stack wizard in the AWS CloudFormation console with the stack name, the template URL, and default parameters already filled in. Launch stack URLs are useful to bloggers, internal teams of a company, trainers, independent software vendors, or anyone who wants to provide a quick up and running solution to their users. Before you construct a launch stack URL, save your template in an Amazon S3 bucket and grant open and download permissions to users who should have access to your template. From the Amazon S3 console, you also need to retrieve the URL of the template file. The region parameter specifies where the stack will be created. If you don’t specify a region, users are directed to the region they last used. The stack_name parameter is a unique name that identifies the stack. The template_location parameter is the URL of the template file. Anyone who follows that URL is directed to the Create Stack wizard in the AWS CloudFormation console, with the specified stack name and template location, as shown in the following screenshot. Users can still specify parameters or other stack options. If they are not already authenticated, users are directed to the AWS Management Console sign-in page and then redirected to the AWS CloudFormation Create Stack wizard. To make your launch stack URL more visible, try our Launch Stack image ( ), which is available at https://s3.amazonaws.com/cloudformation-examples/cloudformation-launch-stack.png. 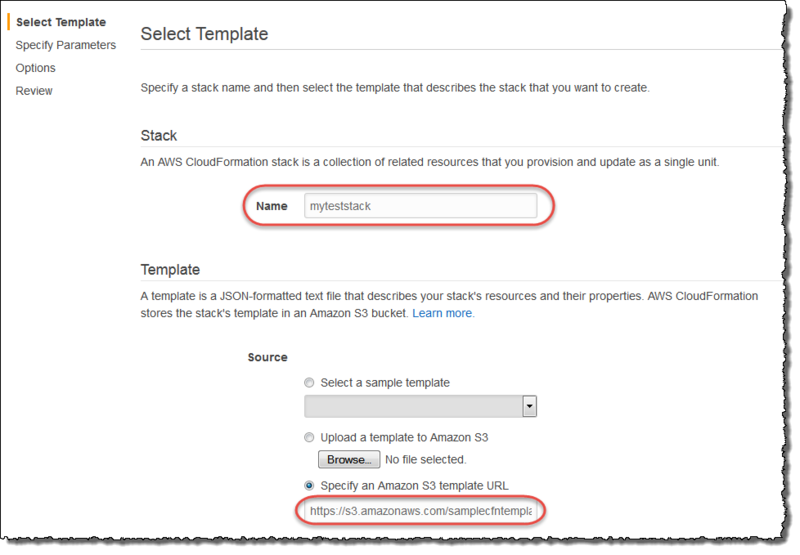 At AWS, we use launch stack URLs with our sample templates to enable our customers to quickly launch the templates.